Rocco looks like a peanut next to Norman! 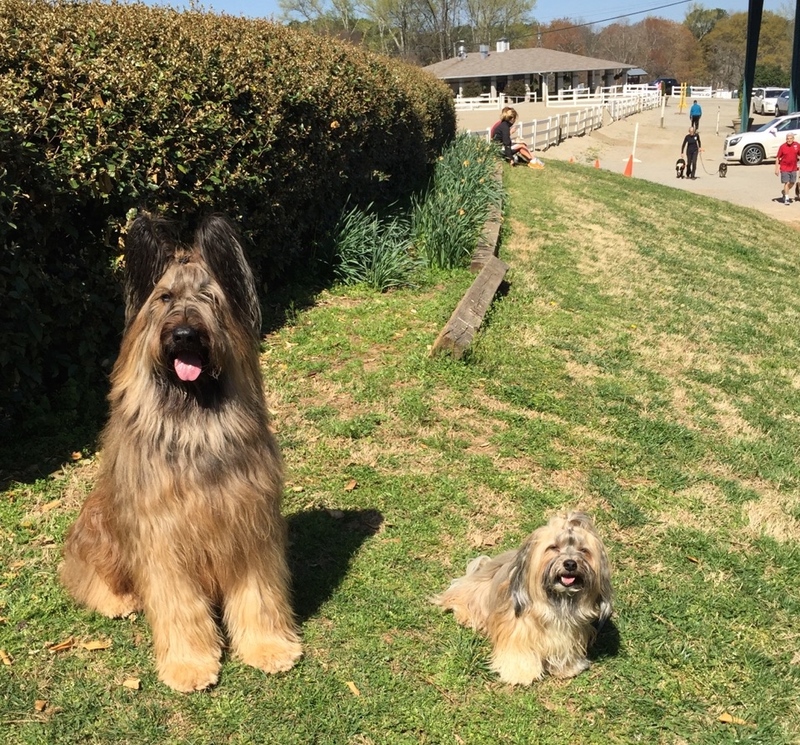 Last weekend we headed to an agility trial at Wills Park in Alpharetta, Ga., and look who we ran into!! It's Norman the Scooter Dog! Norman is famous for his world record scooter run and he's been on lots of tv shows. We're honored that he's our pal! We thought it was super cool that Norman was competing in one of his first agility trials. In fact, he earned his Novice Standard and Jumpers titles at the trial. Back to Rocco's runs, we competed in our first AKC Premier Standard class over the weekend. 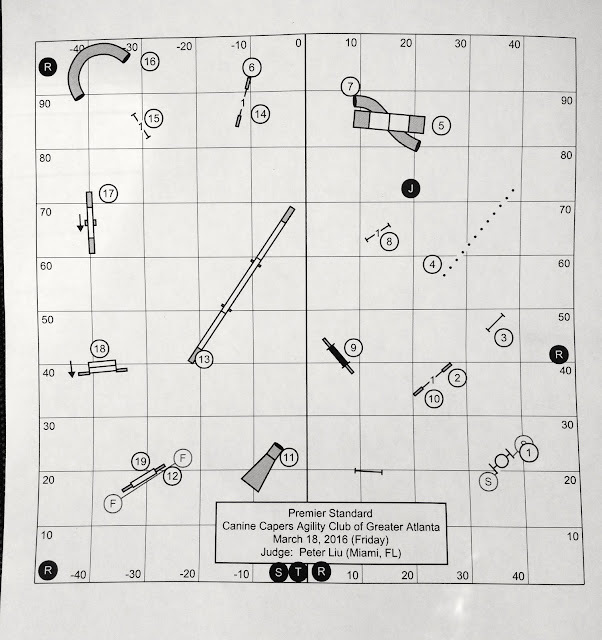 That's a new event offered in AKC agility that features some of the current international style of handling -- back sides of jumps, harder weave pole entries and challenging sequences that require advanced handling skills. Norman's mom videotaped our run, so you can see how we did! We were a bit slower than usual since we're still mastering many of these advanced skills, but we still qualified with 10 seconds to spare! Next week we will be celebrating THREE years of holding our FitDog Friday Blog Hop and after much thought, we've decided it's time to retire the hop. We've covered all sorts of activities you can do with your pups and hosted K9 Kamp and some special fitness challenges as part of our weekly FitDog Friday feature. Hundreds of fellow bloggers have joined us each week and shared their fitness tips and experiences. It's been a great learning experience for all of us! Along with our co-hosts SlimDoggy and My GBGV Life, we'll miss seeing you each week (but sure hope you'll still stop by even without the hop! We will continue to post about lots of fun activities and healthy living with pups so be sure and continue to visit! Please join us next week for our final Hop and share with us some of your favorite FitDog Friday experiences. That's great! We have several agility friends these days, so we are seeing more and more stuff about the sport. It's a lot of fun and growing in popularity! How brilliant to see a famous friend! It was so much fun and great to see Norman! How cool you ran into Norman. Congrats on the Q! ¡Hola. ¿Sabías que los juegos Friv son gratis? Hay muchos juegos en Internet para jugar sin costo. No es tan difícil encontrar juegos de Friv sin costo, puedes descubrir el juego de cada ranking si encuentras un sitio para juegos de PC de confianza. La red utiliza muchos centros excelentes y el juego en línea para PC es uno de esos centros. No habrá problemas ni adquisición en la aplicación. Seguramente tendrás todos los juegos Friv online, no esperes, comienza y diviértete jugando con friv gratis. Existen numerosos videojuegos reputados en línea que podrían proporcionar entretenimiento considerable. Por lo tanto, navegue por la Web y encuentre su juego Friv favorito en este sitio web para pasar su tiempo libre jugando algunos de los últimos juegos e incluso los populares juegos. Gracias!